The Jagadeeshwara Mandir in Powai standing atop a tiny hillock was consecrated by Pujya Gurudev himself. 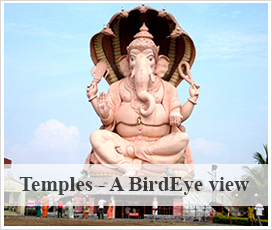 The Temple Gate, known as Jagadwara is built on the lines of the Buddhist Stupa of Sanchi. The two pillars of the gate have stories from the Shiva Purana carved on them with precision and artistic workmanship. Three carved beams sit on top of the pillars. The centre of the second beam carries an inscription from the Quran, "Through me you stand in the presence of the Lord of the Universe". There is a huge temple bell hanging from the centre of the third beam. The gate symbolizes the union of the Indian culture with Arab secular influence & the influence of Buddhism on temple architecture. The presiding deity Lord Shiva made of spotless white marble sits in Samadhi - the meditative pose. On his right is an idol of Lord Krishna as Venugopal and on his left is Mother Ganga, symbolized as a pot of water from the Ganges. Within the sanctum sanctorum, in the centre below the ground level is a Shiva Lingam and daily rituals are done to this Lingam. An idol of Lord Ganesha in meditative pose is placed in the parikrama corridor, behind Lord Shiva. The idol is made of black stone. Nandi, the vahana of Lord Shiva faces the deity and guards the Wish Pond where devotees drop coins & make a wish. The dome of the temple is 34 ft high from the Sanctum Sanctorum and is made of 3 parts, a square, an octagon and a circle. The circular part represents the Shiva Linga. The octagon, an eight hooded snake - representing the pancha mahabootas of Space, Air, Fire, Water and Earth and three other subtle elements - mind, intellect and ego. The main hall has two niches in which the idols of Guruparamparas are installed. 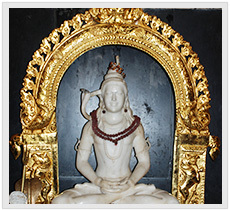 One niche has the idol of Adi Shankara and the other has Adi Guru Dakshinamoorthy. Outside, near the Jagadwara is a metal lamp mounted on a Koorm (tortoise) that symbolizes the withdrawal of the mind from worldly pleasures. Mahashivaratri is celebrated every year in February / March with akhanda nama japa. Hundreds and thousands of devotees throng the temple throughout the day.